Buy this item and earn 836 ClubPoints. 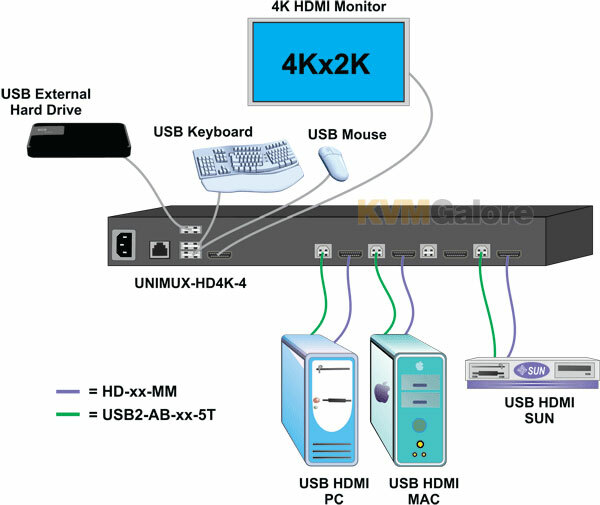 UNIMUX™ HDMI-USB KVM switch allows a single user to control 8 Ultra-HD 4Kx2K 30Hz USB computers with one USB keyboard, USB mouse and 4K HDMI monitor. Dedicated internal microprocessors emulate keyboard and mouse presence to each attached CPU 100% of the time so all computers boot error-free. 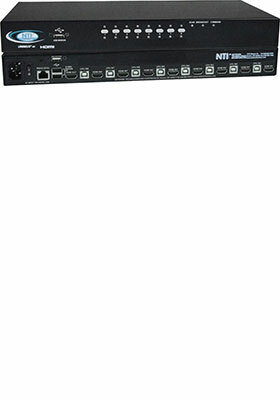 UNIMUX™ HDMI-USB KVM switch features an on-screen display (OSD) and a built-in fully transparent USB 2.0 hub. This means that when a USB device is connected to a transparent USB port, it is the same as if the device was being plugged directly into the computer's USB port. The transparent USB hub is capable of supporting any two low-, full-, or high-speed USB 2.0 devices, including but not limited to touchscreens, card readers, printers, scanners, and thumb drives. Connections use standard HDMI and USB cables. HDMI 1.4 resolutions up to 4k @ 30Hz are supported. • Two transparent USB 2.0 ports (low/full/high speed), in addition to keyboard and mouse ports, for connecting USB devices such as printers, game controllers, USB flash drives, touch screen monitors, whiteboards, etc.